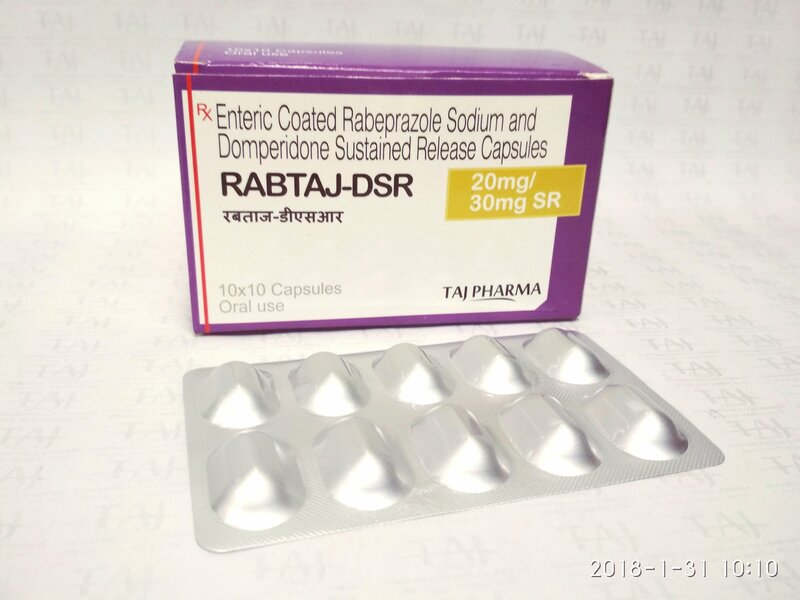 Rabtaj DSR is a medicine introduced with a chemical mixture of Rabeprazole Sodium & Domperidone Capsules. This combination is given to treat an upset stomach. Mainly prescribed in complaints of GERD, NERD and diabetic gastroparesis. Rabeprazole Sodium helps with sustained acid-suppressing effect in the stomach while Domperidone helps to fight with conditions like bloating, fullness, heartburn etc. Rabtaj DSR is also available in tablet form. Rabeprazole+Domperidone Capsules is used for Gastric acidity, Gastro-intestinal reflux, Treatment for symptoms associated with idiopathic or diabetic gastroparesis, Stomach ulcers, Treatment for intractable nausea and vomiting, Gas, Intestinal ulcers, Belching and heavy bloating, Intestinal ulcer, Vomiting and other conditions. Rabeprazole+Domperidone Capsules may also be used for purposes not listed in this medication guide. Rabeprazole+Domperidone Capsules contains Domperidone and Rabeprazole as active ingredients. Rabeprazole+Domperidone Capsules works by blocking the dopamine receptors; blocking the activity of the proton pumps in the stomach wall;Taj Pharma manufactures Rabeprazole+Domperidone Capsules. Detailed information related to Rabeprazole+Domperidone Capsule’s uses, composition, dosage, side effects and reviews is listed below. Rabeprazole+Domperidone Capsules may also be used for purposes not listed here. Blocking the activity of the proton pumps in the stomach wall. The following is a list of possible side-effects that may occur from all constituting ingredients of Rabeprazole+Domperidone Capsule. This is not a comprehensive list. These side-effects are possible, but do not always occur. Some of the side-effects may be rare but serious. Consult your doctor if you observe any of the following side-effects, especially if they do not go away. Rabeprazole+Domperidone Capsule may also cause side-effects not listed here. Before using Rabeprazole+Domperidone Capsule, inform your doctor about your current list of medications, over the counter products (e.g. vitamins, herbal supplements, etc. ), allergies, pre-existing diseases, and current health conditions (e.g. pregnancy, upcoming surgery, etc.). Some health conditions may make you more susceptible to the side-effects of the drug. Take as directed by your doctor or follow the direction printed on the product insert. Dosage is based on your condition. Tell your doctor if your condition persists or worsens. Important counseling points are listed below. The following are the results of on-going survey on CapsuleWise.com for Rabeprazole+Domperidone Capsule. These results only indicate the perceptions of the website users. Please base your medical decisions only on the advice of a doctor or a registered medical professional. Is Rabeprazole+Domperidone Capsule safe to consume or apply when pregnant? Domperidone: Please consult with your doctor for case-specific recommendations. Is Rabeprazole+Domperidone Capsule safe while breastfeeding? Rabeprazole: Please discuss the risks and benefits with your doctor. Can Rabeprazole+Domperidone Capsule be used for gastric acidity and gastro-intestinal reflux? Yes, gastric acidity and gastro-intestinal reflux are among the most common reported uses for Rabeprazole+Domperidone Capsule. Please do not use Rabeprazole+Domperidone Capsule for gastric acidity and gastro-intestinal reflux without consulting first with your doctor. How long do I need to use Rabeprazole+Domperidone Capsule before I see improvement of my conditions? CapsuleWise.com website users have reported 2 days and 1 week as the most common time it takes before they saw improvements in their conditions. These times may not be reflective of what you may experience or how you should use this medicine. Please consult with your doctor to check how long do you need to use Rabeprazole+Domperidone Capsule. At what frequency do I need to use Rabeprazole+Domperidone Capsule? CapsuleWise.com website users have reported once a day and twice a day as the most common frequency of using Rabeprazole+Domperidone Capsule. Please follow your doctor’s advice on how often you need to Rabeprazole+Domperidone Capsule. Should I consume Rabeprazole+Domperidone Capsule empty stomach, before food or after food? CapsuleWise.com website users have most commonly reported consuming Rabeprazole+Domperidone Capsule empty stomach. However, this may not be reflective of how you should consume this medicine. Please follow your doctor’s advice on how you should use this medicine. If you experience drowsiness, dizziness, hypotension or a headache as side-effects when using Rabeprazole+Domperidone Capsule medicine then it may not be safe to drive a vehicle or operate heavy machinery. One should not drive a vehicle if using the medicine makes you drowsy, dizzy or lowers your blood-pressure extensively. Pharmacists also advise patients not to drink alcohol with medicines as alcohol intensifies drowsiness side-effects. Please check for these effects on your body when using Rabeprazole+Domperidone Capsule. Always consult with your doctor for recommendations specific to your body and health conditions. Do not use more than prescribed dose. Taking more medication will not improve your symptoms; rather they may cause poisoning or serious side-effects. If you suspect that you or anyone else who may have overdosed of Rabeprazole+Domperidone Capsule, please go to the emergency department of the closest hospital or nursing home. Bring a medicine box, container, or label with you to help doctors with necessary information. Do not flush medications down the toilet or pour them into drainage unless instructed to do so. Medication discarded in this manner may contaminate the environment. Please consult your pharmacist or doctor for more details on how to safely discard Rabeprazole+Domperidone Capsule. Taking a single dose of expired Rabeprazole+Domperidone Capsule is unlikely to produce an adverse event. However, please discuss with your primary health provider or pharmacist for proper advice or if you feel unwell or sick. Expired drug may become ineffective in treating your prescribed conditions. To be on the safe side, it is important not to use expired drug. If you have a chronic illness that requires taking medicine constantly such as heart condition, seizures, and life-threatening allergies, you are much safer keeping in touch with your primary health care provider so that you can have a fresh supply of unexpired medications.